Widely use: Ideal for kinds of home gardening works. Such as pruning, digging, weeding, transplanting, branches, loosening soil and more,it is perfect for all your garden needs. Ergonomically:Each trimmer, digger, or seeder tool has soft, ergonomic rubber handle for large or small sized hands to reduce fatigue,provide you with great using experience.giving you more enjoyment when you spend long periods of time tending to your lovely garden. 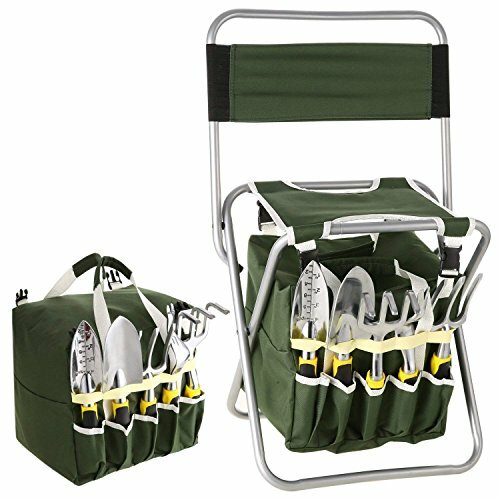 Convenient：Garden tools are conveniently stowed in the outside pockets to be near at hand while other garden items van be stored in the attached tote makes it very convenient for you to access tools. Easy to clean:premium, double-stitched canvas can go right into your washer when it needs a thorough cleaning,no need to worry about damage at all. Kids Garden tool set perfect for small hands, Includes I pair of gardening gloves, garden tool set, kneeling pad, and plant markers, 1 plant pot.